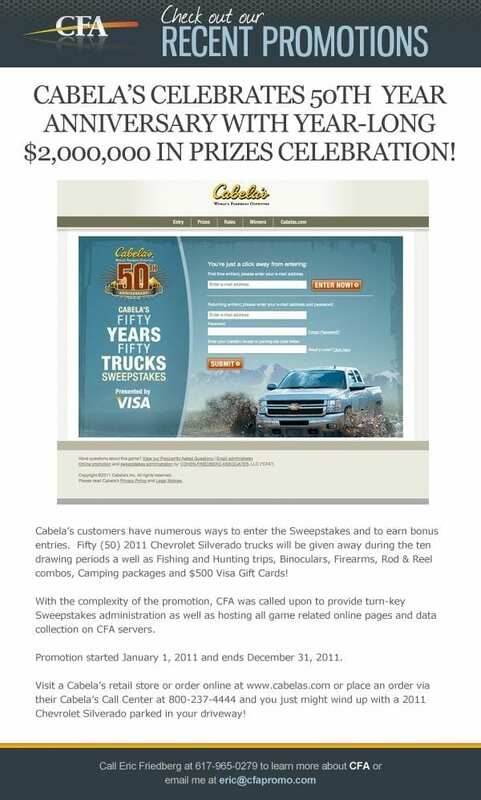 In May of 2011, Cabela’s held a sweepstakes to celebrate their 50th anniversary. The promotion gave away numerous trucks, in addition to a series of other prizes. They also launched a set of merchandise and clothing to celebrate the anniversary as well. In Sidney, Nebraska, lies the headquarters of Cabela’s Incorporated. The well-known specialty retailer is a worldwide marketer of fishing, hunting, camping, and other outdoor-related products. The company was founded in 1961 and has grown to become one of the most popular outdoor recreation brands in the world. The company offers a wide range of high-quality outdoor products with competitive prices, in addition to providing excellent customer service. A whitetail hunting trip for two, for six days and eight nights in the Legendary Northway Outfitters in Saskatchewan, Canada. Canadian walleye fishing trip for two, lasting four nights and three days. In honor of their 50th anniversary, the company also launched a diverse collection of limited-edition merchandise such as a legendary specific designed rifles, binoculars, fly rods, lures, and more. Contestants could enter throughout the year online, in stores, or by purchasing with their Cabela’s CLUB Visa card. All entries were weighted equally. However, participants that used their CLUB Visa card automatically received two entries per purchase at Cabela’s stores and one for purchases made elsewhere. Winners could enter the sweepstakes more than one time. One lucky truck winner only registered once. Regardless of how many times they submitted their names, they all said their fortunes came as a surprise. Cabela’s 50th-anniversary sweepstakes was a huge hit for their customers. Several lucky winners were chosen throughout the year and enjoyed their new trucks and trips of a lifetime. If you would like a list of the winners, you can visit Cabela’s website. Here on our site, you can check out the other sweepstakes, contests, games, and other promotional events that we’ve planned, managed, and administrated. We specialize in sweepstakes management just like this one. Contact us for more information on what we can do for your business.